Bedstone College, in Shropshire, has a vibrant and thriving music music department yet the demands upon the it were such that a recording studio, band practice room and 3 smaller music teaching rooms were ALL required over and above existing facilities. 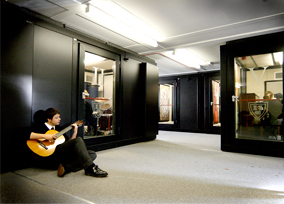 In 2010, desperate for new facilities, they approached Amadeus Acoustic Solutions Ltd. The college had a small amount of vacant space that they thought would physically accommodate such requirements, but were under the impression that there was NO WAY they could happily house such facilities together without creating a distractingly unproductive environment due to the vast amount of noise that would be created within each room or studio. We introduced Bedstone College to our BOXY© acoustic pods with a visit to an installation of these modular rooms at Stonyhurst College and they were blown away by the product. Amadeus and BOXY© were subsequently employed to design and install 5 separate pods and were able to create a complete new facility that fulfilled the school’s brief – all in under one week! Above, students playing Djembe drums. Notice how well the rooms reduce the level of noise being omitted. 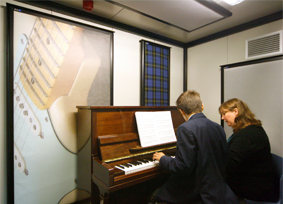 Four separate acoustic pods – each one being used for a very different musical discipline, including full band rehearsal, piano lessons, singing lessons and song writing – were installed literally next door to one another, yet there is no conflicting sound; students work happily within their own pod. The pod walls are adorned with coloured and printed acoustic panels creating a wonderfully calm and creative environment, with glazed acoustic doors to promote light while preventing noise transfer. The acoustic doors also feature the Bedstone College crest and a pod number from 1 to 5, and all the students work in harmony without being distracted by what’s going on next door. The environment created within our Amadeus BOXY pods is incredible – perfect for every sort of music. Lessons can now take place in each room without interfering with what else is happening in the department, and percussion can now sit happily next to piano, violin and singing lessons. “From start to finish the professionalism of John and his team was refreshing in that what they said they would do, they actually did! Amadeus gave us confidence that what we had seen elsewhere could be recreated at Bedstone College, to provide the music department with five state of the art sound-proof practice rooms in an attractive and well-finished environment. Additional confidence was gained from knowing that John would not only oversee the project personally but that once the project was complete he would not just disappear off the scene but return to the College to review the performance of the rooms. Above, private individual piano lesson taking place within an acoustic pod, treated with acoustic panels to create a wonderful acoustic environment from within. The acoustic performance of the pods themselves means that little or no sound escapes. Many thanks to Bedstone College for featuring in our Case Study. Thank you for the fantastic job that you have done in providing us with these pods. They are quite remarkable and have revolutionised the way that we teach and won converts whenever they have been seen.